The Rookie of the Year race this year is a combination of pure fascination and utter despair, with the main contestants some form of inefficient (Dario Saric), uninspiring (Malcolm Brogdon), and unavailable (Joel Embiid). That’s not to say the Bucks and Sixers shouldn’t be happy about the future each of these players have in store. They should. But in a normal year, a stronger contender would take the reins and push these contestants to the side. The sadness does not come from the future of Saric or Brogdon, but that there was no legitimate Rookie of the Year contender to take control of the race when Embiid’s season was cut short in late January. That’s a long way of saying that, while Embiid would typically be removed from conisderation by virtue of missing over half of the season, the absence of a strong contender, and the uniqueness of Embiid’s situation, should keep him at the top. Embiid’s number (20.2 points, 7.8 rebounds, 2.5 blocks, 2.1 assists) speak for themselves. So do the 51 games missed. (Take a look at that last column, on/off diff. The Sixers, the 28 win Sixers, were a +3.2 with Joel Embiid on the court, compared to a -7.9 when he was on the bench, good for an astounding +11.1 points per 100 possessions better when Embiid was on the court. To put it another way, the 28 win Sixers were better with Embiid on the court than the 42 win Bucks were with Brogdon on the court. We’ll get to that in a second). But there’s no Karl-Anthony Towns (18 and 10 as a rookie), Andrew Wiggins (17 and 5), Damian Lillard (19 and 6.5), Kyrie Irving (18.5 and 5.4), or Blake Griffin (22.5 and 12.1) Embiid’s competing against. Heck, there’s not even a Tyeke Evans left in the field. The fact that Dario Saric (12.8 points, 6.3 rebounds, 2.2 assists, 50.8% true shooting) and Malcolm Brogdon (10.2 points, 2.8 rebounds, 4.2 assists, 55.5% true shooting) are the primary challengers forces us to reevaluate what would previously be grounds for disqualification. What are we actually placing value in when we focus on the extra games Saric (81) and Brogdon (75) played over Embiid (31)? Is it impact? If so, the case gets tough to make for either. The Saric vs Brogdon debate has the chance to be interesting, at least from a theoretical point of view. Dario Saric had the counting stats, the traditional requirements for winning the award. Saric’s season averages of 12.8 points, 6.3 rebounds, and 2.2 assists easily beat Brogdon’s 10.2, 2.8, and 4.2. Brogdon, on the other hand, won the efficiency battle. From true shooting percentage (55.5% to 50.8%), to BPM (-0.5, compared to -2.2 for Saric), Win Shares (4.1 to 1.0), RPM (1.73 to -1.88), on/off splits (+4.4 to -3.3), and PER (14.9 to 12.8), Brogdon wins virtually across the board when looking at the more advanced metrics. Which isn’t all that surprising. History has been pretty clear that high-usage rookies, even the most talented ones, tend to struggle mightily as they adapt to the league. Even the giants such as LeBron James (48.8% true shooting, 1.9 BPM, 28.2% usage rate as a rookie) and Kevin Durant (51.9% true shooting, -1.4 BPM, 28.1% usage rate) struggled while they adapted to the league. That’s in no way meant to compare Saric’s future to that of LeBron or Durant. Nobody is that stupid. But it was much easier for 24-year-old Malcolm Brogdon to slide into his role as a perimeter shooter and 4th option than it was for Saric to, at times, lead an offense. Considering Brogdon’s usage rate of just 18.5%, compared to 24.6% for Saric, it would have been shocking for Brogdon not to be more efficient in his role than Saric was in his. What Saric did over the last 30 games, with a 27.4% usage rate and a 54.1% true shooting percentage, was truly impressive. But there is an option that combines the two arguments, efficiency vs role, while throwing in an added dynamic of dominant defense to form one truly impressive rookie season: Joel Embiid. Few rookies shoulder the kind of responsibility that Embiid did during his rookie season, maintaining a 36% usage rate while anchoring the team defensively. 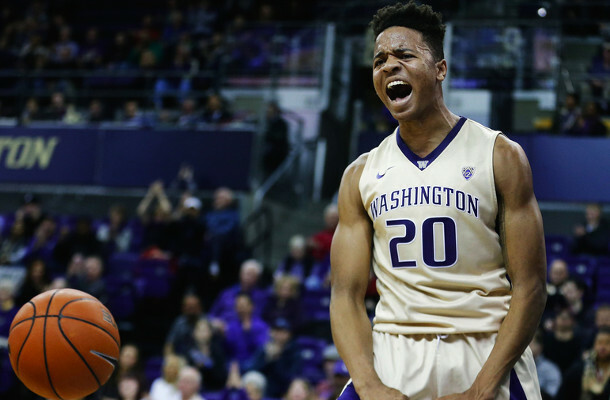 To have walked away with the kind of success that he did – a 58.4% true shooting percentage, leading a defense that gave up just 99.1 points per 100 possessions while on the court — was a stunning accomplishment. That last part is key, and a part that really separates himself from Saric and Brogdon. Few *players*, much less rookies, were capable of anchoring a defense the way Embiid did while carrying that kind of offensive burden. He changed the culture of a team that was borderline incompetent defensively last year, and he did so virtually overnight. He made the team relevant, both locally and nationally, while giving real hope to a fan base desperate for it. And because of that there’s a real case to be made that Embiid was not only the best rookie, but that the impact he made on the team was greater than either Saric or Brogdon, despite the limited number of games played. The case to vote Embiid over Saric is actually pretty easy to make: through 51 games (the difference in games played between Saric and Embiid) Saric was shooting just 37.7% from the field, 32.1% from three-point range, while being limited defensively by virtue of athleticism and inexperience. While Saric showed flashes of skills during this stretch of play (flashes that we’d see more consistently in the second half of the season) you could make the very real case that he was hurting his team in the won/loss column during the first 51 games. Should this really be the difference in the Rookie of the Year race? Should this be what we reward with votes? The case against Brogdon is one of ability vs availability. If you take the top games by these three rookies and sort them by Game Score, Embiid’s dominance really shows. In the top 10 games between Embiid, Saric, and Brogdon, Embiid walks away with 6 of the top 10 performances, compared to none for Brogdon. Embiid has 7 of the top 15, Brogdon 2. Embiid 11 of the top 25, Brogdon 5, and that’s despite the fact that Embiid only had a 31 game sample to draw from. 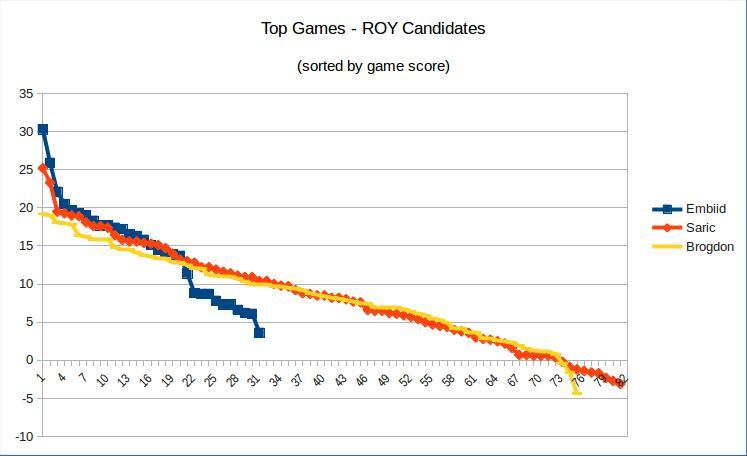 The graph below sorts each of the three ROY candidate’s games by Game Score, descending best to worst. Looking at that graph points out three things. First, Embiid’s top 20 games blow Brogdon’s out of the water, despite the fact that Brogdon had a 75 game sample to choose the best from and Embiid only 31. The second conclusion is just how remarkably consistent Embiid was. Finally, the “extra” games Saric and Brogdon played, which are supposed to propel them to the award, weren’t, um, all that good. Embiid’s worst game of the season resulted in a Game Score of 3.6. By Game Score Saric had 21 games worse than Embiid’s worst game, Brogdon 15. Saric had 31 games worse than Embiid’s 2nd worst game. Brogdon 22. Embiid had just 1 game with a Game Score below 5, which accounted for 3.2% of his total games played. 33.3% of Saric’s games played were at a level below a Game Score of 5 and 25.3% of Brogdon’s. That’s certainly not to say that Game Score is a perfect metric, but you could have arrived at the same three conclusions just by watching them play. Embiid’s brilliance, his consistency, and his impact was something that neither contender could even sniff, and Embiid had a far bigger role on both ends of the court than Saric or Brogdon would shoulder. Is availability really the only criteria needed to deny Embiid’s dominance? Does Saric being a net negative during the first half of the year factor into the analysis of the benefit of games played? Is Brogdon’s ability to fill a role as a 4th option, without many games where he carried the team, a truly compelling case? Did Embiid do more for the 76ers in 31 games than Brogdon in 75 or Saric in 81? If there’s a case to be made, and I think there is, a line in the sand of “he didn’t play enough games” should be reevaluated. This year was different. 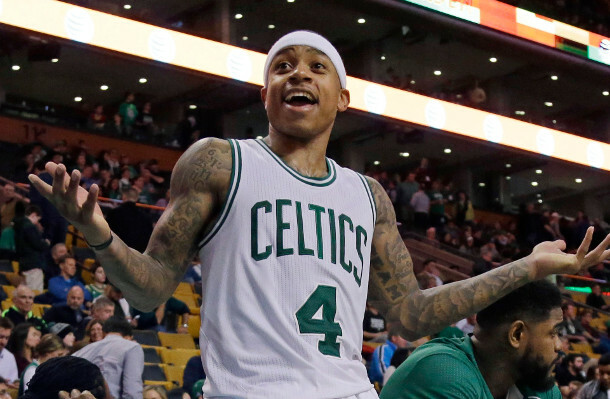 The exact criteria for Rookie of the Year is ambiguous, allowing voters to create their own reasoning. This isn’t the All-Star spot, where other candidates playing at an All-Star level factored into the importance of availability. This is the Rookie of the Year, where you had one player performing at a level truly warranting the award and two players who were generally available for their team, sometimes helping and sometimes not. Vote for Saric and you’re saying being on the court, regardless of if you’re even helping your team win, is the defining criteria. Vote for Brogdon and you’re saying availability is more important than dominance. Neither are compelling arguments in my mind. 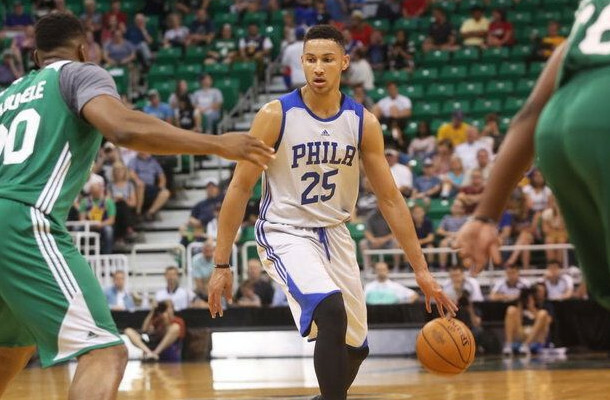 Embiid was the only player in this class capable of succeeding as a focal point for his team. Embiid was the only player capable of anchoring a world class defense. Embiid was the only rookie asked to lead his team offensively. Embiid was the only rookie asked to turn a franchise around. Embiid was the only rookie who impacted every game he played. Embiid was the most irreplaceable rookie. Embiid’s rookie season is the only one we’ll remember in 5 years time. Embiid was the best rookie. 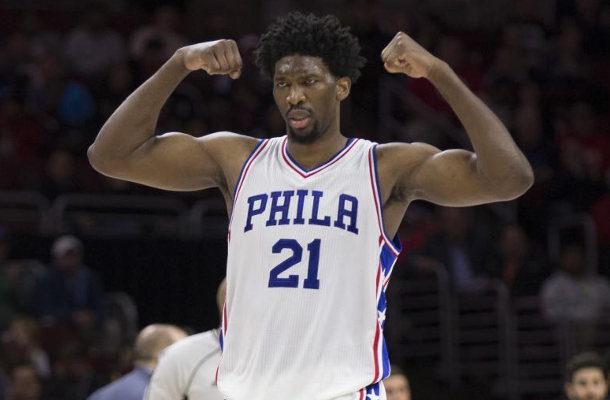 Embiid should be Rookie of the Year. *note: I do not have a vote.